Haaretz says Oded Kotler left his home ahead of a right wing demonstration Tuesday, on police recommendation; doesn't say if he came back. 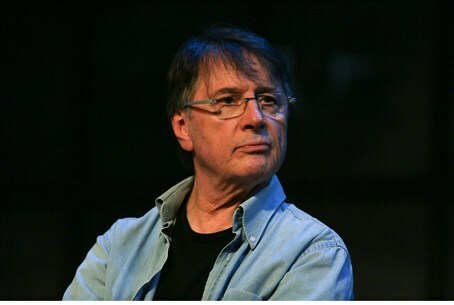 Ultra-leftist paper Haaretz reported Thursday that veteran actor Oded Kotler left his home in Tel Aviv Tuesday, on police recommendation, ahead of a nationalist demonstration that took place outside his home that day. The newspaper does not say if and when Kotler has returned to his home, and appears to imply he has not. A group of Otzma Yehudit activists, led by former MK Dr. Michael Ben-Ari, Attorney Itamar Ben-Gvir and coordinator Yossi Davidov, held a symbolic and comical protest outside Kotler's home on Tuesday. Kotler raised a storm at an artists rally on Sunday when he called Likud voters "straw-chewing beasts," saying that without the artists of Israel, there would only be the ruling party "followed by a marching herd of beasts chewing straw and stubble." "We came here today to expose the hypocrisy and the arrogance of Kotler, (Yair) Garbuz and their friends who are sure that they are the masters of culture and everyone else are beasts," said Ben-Ari, in a reference to the artist Garbuz who possibly lost Labor the elections by slamming "amulet kisser" right-wingers at a leftist rally. Video from the protest, in Hebrew, can be seen below.